Monogbe Tunde, G. , Achugbu Austin , Uzowuru Lawrence, N. , Edori, Daniel, S.
The nature of relationship between deposit money banks loan to certain sector of the economy and its possible effect of reducing poverty rate in Nigeria is controversial and significant. As such, this study set out to examine the extent to which deposit money bank loan and advances to SMEs, agricultural, and manufacturing sectors in Nigeria has helped in reducing poverty rate. To achieve the objective of the study, unit root test, auto regressive distributive lag estimate and causality test were employed. Result shows that deposit money bank loan to SMEs and agricultural sector seem to be inversely related to poverty rate in Nigeria while sectoral allocation to the manufacturing sector is not capable of reducing poverty rate in Nigeria. This inherent relationship between loans to manufacturing sectors and poverty reduction in Nigeria could be attributed to some structural factors cited in the body of the paper. In the light of these findings, this study concluded that (i) Poverty rate in Nigeria is significantly sensitive to deposit money bank credit to agricultural sector; (ii) Within the context of the study, deposit money bank allocation to SMEs has helped in reducing poverty rate in Nigeria to the tune of 1.821 unit. On this premises, it is recommended that bank ordinances and financial institution act should be review to ensure that more credit is allocated to agricultural and SMEs sector as this will help in reducing the ever teaming trend of poverty in Nigeria through the window of job creation. Having subjected our data set to rigorous analysis, it is established within the context of this study that sectoral allocation of deposit money banks loan and advances to small and medium scale enterprises has significantly contributed to economic growth such that poverty trend is being reduce to the tune of 1.82135 unit all things being equal. Further, deposit money bank allocation to the manufacturing sector does not seem to be significant in boosting economic output, as such poverty trends remain unchanged. This paper examines external debt and economic growth relationship in a panel of 48 Sub-Saharan Africa countries (SSA) for the period 1990-2017 using a two-step system General Method of Moments (GMM) technique. Our study shows that contemporaneously, external debt has a negative and statistically significant impact on GDP growth. However, the first lag of external debt variables stimulates GDP growth. The implication is that external debt accumulated in the previous period makes funds available for growth enhancing expenditure in the next period. Furthermore, our study found no evidence of a non-linear relationship between debt and economic growth. Lastly, we found that the deleterious impact of external debt on GDP growth does not preclude poor or rich SSA countries. We recommend the adoption of state-of-the-art measures in collecting domestic revenue to complement external revenue sources. In addition, we advocate for strong macroeconomic environment in SSA so that yield negotiation on the debt will not dissipate the coffers of SSA countries via high debt servicing cost. This study uses new estimation methodology to unravel the external debt and economic growth nexus in Sub-Saharan Africa countries. This study examined the contemporaneous effect of global economic policy uncertainty on Nigeria’s export earnings, using Nigerian data that spans from 1997 to 2016. 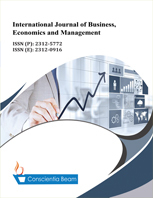 The theoretical framework relied on the contemporaneous theory of external vulnerability, which posits that macroeconomic shocks from dominant economies could be transferred to lesser dominant economies through international linkages of global economies and financial market. To achieve objective, this study employed the ARDL and GARCH estimation techniques, to estimate the effect of global economic policy uncertainty on Nigeria’s export earnings. The results revealed the adverse effect of global economic policy uncertainty on Nigeria’s export earnings, affirming the vulnerability of Nigeria’s export earnings to external shocks. The practical implication of the finding is that developing economies could insulate their domestic macroeconomic environment from external shocks by diversifying their economies. Importantly, Nigeria should increase diversification of her export base as a coping strategy for protecting against the contemporaneous effect of global economic uncertainties. The study contributes to existing literature focusing on export earnings, which is a major source of vulnerability to external shocks in Nigeria. The use of global economic policy uncertainty index appears novel, compare to previous studies that use global output and inflation. In this research, we study factors such as consumer attitudes and personal innovativeness in order to understand the effect of loyalty on satisfaction with mobile wallet applications in Thailand. We developed a research model, based upon previous research, where we propose and examine four constructs. In general, consumer attitudes and personal innovativeness loaded strongly on both loyalty and satisfaction with the Thai consumers sampled. We found strong support for all of the hypothesized relationships, albeit some at different strength levels. It was found that consumer attitudes are an extremely strong factor that increases loyalty and improves satisfaction with mobile wallet applications in Thailand. We also found a very strong impact of satisfaction on loyalty with Thai consumers. This study helps to understand how specific factors influence consumer satisfaction with mobile wallet apps, and what drives consumers’ decisions to be loyal and satisfied customers. This study contributes in the existing literature of consumer behavior, particularly consumer satisfaction model. This study uses new estimation methodology of survey construct with snowball sampling approach. This study originates new formula for predicting Thai consumers’ satisfaction in mobile wallet usage. This study is one of the very few studies which have investigated in factors influencing the satisfaction with mobile wallets apps. The paper’s primary contribution is finding that consumer attitudes has a significant influence on Thai consumer loyalty and increase satisfaction. The study centred on participatory decision making and organizational goal attainment. This study investigated the extent to which participative decision making affects the organizational goal attainment. The study had a sample size of 136 obtained using the Cochran statistical formula. The study employed a survey research design. The instrument used for data collection was the questionnaire. The data from the responses were presented in frequencies, simple percentages. Three hypotheses were tested using the chi-square X2 and t-test statistical tools. The study found out that: Employee participation in decision making significantly improves job productivity (X2 cal = 2.554 > X2 0.5 = 0.6763); employee participation in decision, making relates to employee motivation (Fc – test = 21 .56 > ft 1 = 2.01); the policy of employee participation in decision-making is significant in organizational goal attainment (X2 Cal = 1.887 > X2 0.5 = 0.6763) The study, based on the above findings, concluded that for the goal attainment of any organization to be achieved successfully depended on the extent to which the organization integrated the workers into the policy formulation and implementation. The study recommends that organizations should adopt the ring show management theory as a way of survival. This study is one of the very few studies which have investigated employees’ participatory decision making and organisational goal attainment. Currently there are paucity studies in Abuja that examine organisational goal attainment. This study contributes an important additional dimension in the search for sustainable organisational goal attainment in Nigeria.